Pub in Mayfair, just off Oxford Street. Situated as it is in something of a pub desert, this Punch Taverns pub is perhaps more worthy of note than it might be elsewhere. Prior to a refurbishment in late 2008, it was part of Punch's Eerie subchain, but the Hammer Horror decor has now given way to a more standard chain-pub style. Kake and friends visited on a Wednesday evening in June 2011. There were a few free tables on the ground floor when we arrived around 6pm, and more in the basement (though there was also a large tour group down there). Music was playing, not too loud. It was quite dark at the back of the ground floor; too dark to read a book comfortably. 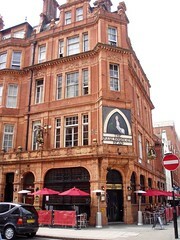 Three of the four handpumps were on, offering Young's London Gold (£2.99/pint), London Pride, and Bombardier; the fourth had a clip for Hopback Summer Lightning, but was marked as "not available". Kake's pint was a good centimetre short, but the member of staff who served it appeared not to notice this, as no top-up was offered. Another of our party also had something of a service issue later, with a request for a pint of shandy causing much more faff than necessary. Accessibility: One step to get in. Toilets are in the basement, down a flight of stairs with a couple of bends and a handrail. Last visited by Kake et al., June 2011. Last edited 2013-05-10 07:33:12 (version 3; diff). List all versions. Page last edited 2013-05-10 07:33:12 (version 3).